A team from the Planning Inspectorate in Bristol recently rose to the challenge of a call from help from Fair Furlong School in Bristol. With these words ringing in our ears we set about the work eagerly. There were two main tasks for to complete. 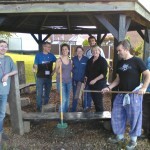 The first was to paint and refresh 12 picnic tables and 4 ‘shop-fronts’; the second was to clear weeds and lay fresh bark chippings on two old pathways leading to outside learning areas. Nine of the Strategy & Communications team had volunteered and we split ourselves appropriately across the tasks to get the best out of our time. By the time of morning break we had completed the first set of 4 tables and made significant progress on the first pathway. During the break we received a good deal of attention from the children, mostly asking “What are you doing?” generally followed by “Why?” - several times. By the end of break we had them organised so when further quizzical children arrived they would be advised of our purpose for being there by their schoolmates! We had completed 8 picnic tables and were working on the second pathway by lunch. We had just sat down to compare stories of the morning’s work when Charlotte Hollis set us a fantastic example by returning straight to the work on hand. For this reason and amazing effort throughout the day Charlotte was voted ‘star’ worker of the day by our group. 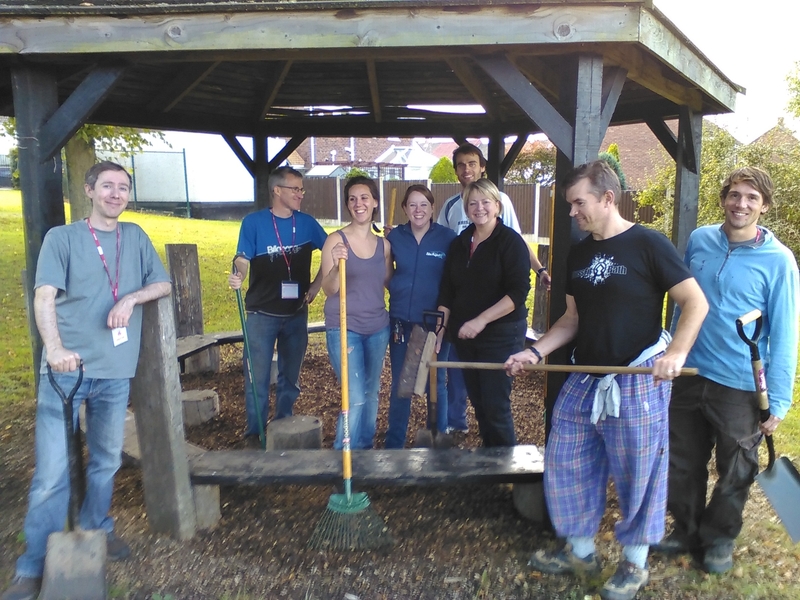 We finished the tasks just within the allocated time and, with a couple of minutes spare, used the remaining bark-chippings to refresh an outdoor seating area. To give some perspective of what we had achieved; George, the Site Manager, advised it would have taken him over two weeks to complete the same amount of work on his own. At the end of the school day we receive some inquisitive looks from parents picking up their children. Who were these people covered in paint and looking shattered but contented? Throughout the day the children were a joy and the teachers very welcoming and grateful for our support. The school had a lovely atmosphere exemplified by George, who not only kept us going with tea during the day but clearly loved his job and the school. The Headteacher came out to thank us for our efforts and we even appeared in the weekly school newsletter made available at the end of the school day. We all agreed it had been an excellent day. We had made a difference and done something worthwhile to support a school that is working tirelessly to make a difference to the children that it nurtures. Working together also brought our team closer together. We enjoyed seeing the fruits of our labour taking shape and seeing what we had achieved at the end of the day. Something that isn’t always possible in the office! The school would like to have us back in the future and there are a number of others across the area which really do need some support. ….and the rain started about 3 hours after we finished up for the day. My thanks go to all of the volunteers from Strategy & Communications and also to those who stayed behind to cover the phones and the work.